The first time Beatriz* started taking treatment for HIV was around a year ago. She stopped taking it after just two days. In Timor Leste, the anti-viral tablet we usually prescribe for HIV frequently causes nausea, nightmares and dizziness. A year ago, Beatriz had no idea what her side effects meant. Crucially, nobody told her that the side effects are nearly always temporary. What would you do, if the tablets you were taking made you dizzy and ill? Particularly if you had only the vaguest idea what the tablets were actually for? What if you were scared, and very young, and your husband told you this supposed HIV diagnosis was probably nonsense anyway? The reasons patients stop taking treatment are complex and heartbreaking. 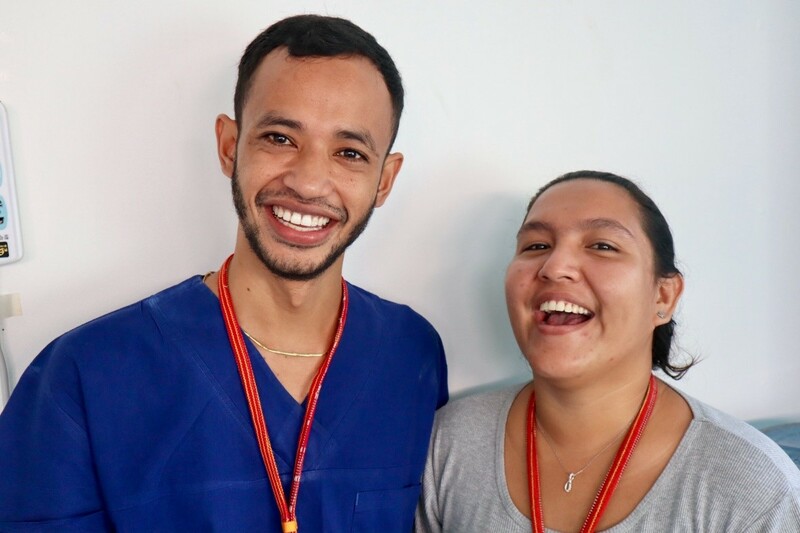 Fewer than half of those diagnosed with HIV in Timor Leste are successfully supported to take life-saving antiretroviral therapy long term. This time around though, things would be different for Beatriz. How could you not feel better with these two smiling at you? During the first few visits to our clinic we heard only small whispers from this very shy girl, from behind a screening curtain of hair. But she listened, as Dr Odilia carefully described how the antiviral tablets work, suppressing HIV so that the immune system has a chance to recover. She paid attention as our nurse Madalena taught her how to make a tea with ginger root and honey, to help with nausea. Nina and Ano reassured her that the symptoms would pass after a week or so. And they did. “Your body has made friends with the medicine now,” Madalena told her, smiling. Beatriz beamed back at her. Unfortunately, the extensive fungal infection in her mouth and throat indicate that her immune system has been badly damaged by years without antiviral therapy. Beatriz is now too ill to do housework, and her husband has left her. Most concerning of all, Beatriz has developed a persistent cough, together with heavy sweating at night time. Her weight has dropped to 29kg. Tuberculosis is the number one killer of people living with HIV, and it is ubiquitous in Timor-Leste. It can be frustratingly difficult to identify among HIV patients, but if we miss a diagnosis of TB in Beatriz she will not survive. Patchy infiltrate at the left lung base. Lateral to the flowering vine. 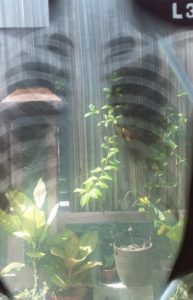 If you look at the x-ray I’m holding up to the window you’ll see a subtle haziness at the left lung base. This is not how one might generally expect TB to appear (intervening foliage notwithstanding). “TB affects the upper lobes,” said Dr Alfredo, correctly. 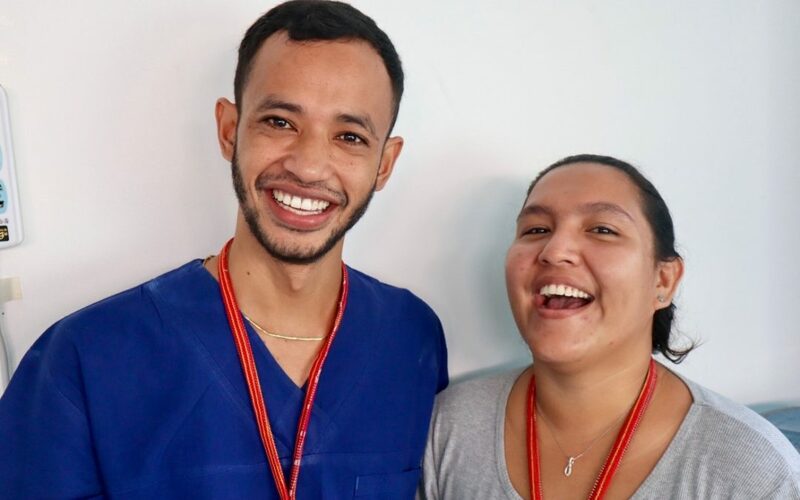 But the unusual x-ray appearance of TB with advanced HIV is just one of many things Odilia and Alfredo are learning, as they develop their skills as HIV doctors. For Beatriz, this is a dangerous time as we balance a multitude of medications for her – to treat her current infections, and to guard her from others. We make appointments to see her weekly. This is quite an ask, since it sometimes means choosing between money for transport, or money for food. But she keeps coming to see us, and she keeps taking all her tablets. Her cough and her night sweats have disappeared. Her smile is wider, and her voice is no longer a whisper. 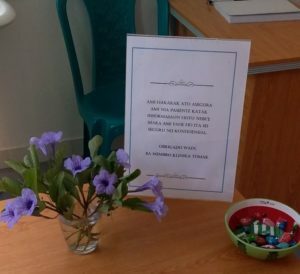 From the weekend checking-in phone calls to the bowl of sweets provided on the table, my team seems to know intuitively how to make our patients feel safe and valued. Patients frequently forget the details of what we say to them. But I don’t think they ever forget the way we make them feel. This sign reassures patients that information will remain confidential – a major concern for people living with HIV. While I don’t have any empiric data to back this up (how would one measure such a thing? ), I suspect that the way patients feel about their HIV service is a key predictor for patients’ adherence to treatment. And by extension, a positive predictor for survival. Dr Eleanor is supported by AVI.